Editor’s Note: Leonard Berlin, MD, FACR, is a radiology professor at Rush University Medical College and chairman of the radiology department at Rush North Shore Medical Center in Skokie, Ill. He began his writing on risk management and malpractice issues in a series of articles in the American Journal of Roentgenology. Those articles became the basis for his well-known book Malpractice Issues in Radiology. This new monthly series, “Risk Management & Malpractice Defense,” is drawn from that book. The third edition of Malpractice Issues in Radiology is scheduled for release this fall and will be available from the American Roentgen Ray Society. The patient was a 23-year-old woman with a long history of Crohn’s disease of the small bowel. She had undergone multiple small-bowel resections when she was admitted to the hospital in a state of cachexia. Late the following morning, a Friday, her surgeon inserted a dual-lumen Groshong catheter into the superior vena cava via the right subclavian vein for hyperalimentation. A portable chest radiograph was obtained (Figure 1 on page 14). Shortly thereafter, the surgeon went to the radiology department to view the radiograph, but the radiologist was eating lunch and was not available for consultation. After examining the radiograph by himself, the surgeon left, asking the radiologic technologist to have the radiologist call him if he saw anything unusual on the film. After returning from lunch, the radiologist gave this interpretation: “A subclavian catheter has been placed from the right side. The tip is slightly more medially placed than usually seen. However, the superior vena cava in this area is frequently quite distensible and the catheter most likely does lie within the lumen. Heart and lungs are normal. A left subclavian catheter is noted.” The radiologist asked the technologist to call the surgeon on the telephone so they could discuss the report. The technologist could not reach the surgeon and was told by the answering service that the office was closed for the afternoon. He left a message for the surgeon to call the radiologist, but a return call never came. The radiologist called the hospital nurse involved in the patient’s care and inquired whether a good blood return from the feeding catheter was seen. The nurse answered that everything seemed fine. No further communication about this patient took place between the radiologist and any other party for the rest of the day or weekend. Later Friday evening, after receiving hyperalimentation fluid through the catheter, the patient developed dyspnea and hypotension, went into shock and cardiopulmonary arrest, and died. Autopsy revealed that the catheter had perforated the vena cava and the hyperalimentation fluid had filled the right pleural cavity. A malpractice lawsuit on behalf of the deceased patient was filed against the radiologist and others involved in the patient’s care. The suit alleged that the radiologist was negligent because he had failed to communicate the possibility of vena cava perforation to the referring physician in a timely fashion so that corrective action could be taken to avoid cardiopulmonary arrest and death. During the pretrial discovery, the radiologist testified that after interpreting the radiograph, he had sufficient concern as to the exact location of the catheter tip that he had attempted to call the attending physician but when he was unable to do so was satisfied by the assurances of the patient’s nurse that the catheter seemed to be functioning well. The surgeon claimed that he would have immediately corrected the catheter placement had he been notified by the radiologist that a problem existed. Although he himself had inspected the postprocedure radiograph, he relied on the radiologist’s higher degree of expertise in radiographic interpretation. A radiology expert retained by the plaintiff testified that the radiologist breached the standard of care by abandoning his efforts to immediately communicate the findings to the surgeon. He also opined that the radiologist showed a lack of concern for the patient’s well-being by the fact that, failing to reach the surgeon with the report, the radiologist had gone home for the weekend and made no effort to contact anyone at the hospital until the following Monday morning. The malpractice case was settled before trial. Kline and Kline in 1992 comprehensively reviewed a number of state appellate and supreme court decisions that dealt with radiologic communication, most of which ruled that radiologists have definite legal duties to communicate radiologic findings to referring physicians and sometimes to patients themselves on a timely basis—immediately if the patient’s care requires it.5 That the courts are expanding the communicative responsibilities of radiologists is highlighted in two court decisions. In some situations indirect service may provide justification for the absence of direct communication with the patient, but that does not in any way justify failure of communication with the primary care physician. … We are unable to agree … that radiologists … who merely provide what they term “indirect medical care” may somehow categorically escape all liability once such a practitioner has made a correct analysis and has done no more than to relay this information through ordinary hospital channels. Once the physician-patient relationship has been found to exist … the professional responsibilities and duties exist despite the lack of proximity, or the remoteness of contact between the two as where a consulting physician is involved in the case in only a limited manner. Therefore, all physicians involved in a case share in the same duties and responsibilities of the primary care physician to the extent of their involvement. Knowing that the tube was not in place, the [radiologist] nevertheless handled the situation as a matter of routine. While this routine was taking its course, [the patient] was in a life-threatening situation and indeed almost died. He deserved more than routine care under these circumstances. … When a patient is in peril of his life, it does him little good if the [radiologic physician] has discovered his condition unless the physician takes measures and informs the patient, or those responsible for his care, of that fact. That timely and appropriate communication of radiologic results to referring physicians is essential has been recognized by the courts and codified by the American College of Radiology in its standards. All radiologists must familiarize themselves with and comply with these standards. Risk management in radiologic practice can lessen the likelihood of incurring a medical malpractice lawsuit and maximize the chances for a successful defense if a suit is filed while at the same time enhancing good patient care. The following risk management communication pointers will help radiologists meet all three of the following objectives. 1. If the radiologist has any reasonable belief that a radiologic finding requires treatment of the patient before delivery of a written report in the mail or onto a patient’s hospital chart, the radiologist should telephone a report to the referring physician immediately. 2. If the referring physician cannot be located, a message may be left with the physician’s nurse or associate, with the acknowledgment by that individual that he or she will assume the responsibility of notifying the referring physician or undertaking care of the patient. If none of these individuals can be located, the radiologist should attempt to locate an alternate physician who is covering for the primary physician. For rare situations in which the radiologist cannot locate the referring physician or his or her delegate and the radiologist feels that immediate treatment of the patient is necessary, the radiologist should contact the patient directly and inform the patient to come to a hospital emergency department for care. Although radiologists traditionally report results to the referring physician rather than to the patient directly (except for self-referred patients undergoing mammography), from a legal point of view, the radiologist’s ultimate responsibility is to the patient. If the radiologist cannot transmit urgent reports to the patient’s physicians, then he or she must transmit them to the patient directly. 3. Once a radiologist decides that a finding needs to be reported via telephone, he or she must continue efforts to reach the referring physician or an acceptable alternate to complete the communication. Terminating attempts at communication because the referring physician is not easily available, as was done in the case described, places the radiologist in greater medical and legal jeopardy than not having attempted to telephone in the first place. • Once verbal communication is completed, it should be documented. A medical-legal truism states, “If it wasn’t documented, it wasn’t done.” A radiologist who, several years after an incident, says to a jury, “I think I called the referring physician, but I can’t remember for sure and have no documentation that I did,” loses credibility. Nothing is worse in defending a medical malpractice lawsuit than having two physicians pointing fingers at each other, one saying, “I called you,” and the other saying, “No, you didn’t.” Documentation at the time an event takes place is credible evidence in a court of law. • Documentation of verbal communication should be placed in the radiology report if possible. If the verbal communication is completed after the radiology report has been dictated and signed, then the radiologist should keep a log in the department and document all pertinent discussions as they occur. An acceptable alternative would be to issue an addendum report that documents the communication. — “Communicating an Urgent Finding” appeared in its original form in the American Journal of Roentgenology. It is reprinted here with permission of the American Roentgen Ray Society. 2. If the referring physician cannot be located, a message may be left with the physician’s nurse or associate, with the acknowledgment by that individual that he or she will assume the responsibility of notifying the referring physician or undertaking care of the patient. 3. Once a radiologist decides that a finding needs to be reported via telephone, he or she must continue efforts to reach the referring physician or an acceptable alternate to complete the communication. 1. Berlin L. To telephone or not to telephone: How high is the standard? Am J Roentgenol. 1992;159(16):1335-1339. 2. Berlin L, Berlin JW. Malpractice and radiologists in Cook County, IL: Trends in 20 years of litigation. Am J Roentgenol. 1995;165(4):781-788. 3. Liston SE. A new type of cancer lawsuit is emerging. ACR Bulletin. 1990;46(4):14. 4. Schwinger HN. 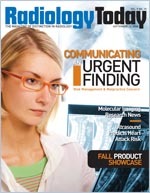 Liability problems in radiology communications exist. ACR Bulletin. 1990;46(7):33. 5. Kline TJ, Kline TS. Radiologists, communication, and resolution: A medicolegal issue. Radiology. 1992;184(1):131-134. 6. American College of Radiology. ACR standard for communication: Diagnostic radiology. In: Standards. Reston, Va.: American College of Radiology; 1995: 5-6.